Well the weekend promised so much, but as I write this at 07.47 on Sunday it's tipping down. Yesterday however along with great swathes of the UK, I experienced a real summer's day, for ...ohh must be 3 months. It was glorious, although I felt strangely sad not having to wear waterproofs, they've become close friends recently. Which was typical. The only warm and sunny day for weeks and I had lots of "to do's". Which meant after collecting replacement plastic trim for my car (things fall off Fords), buying a kitchen table in Gillingham, and having a gloriously succulent Shin Beef lunch at the Udder Farm Shop. I then found myself at..... Fifehead Magdalen, or to be more precise St Mary's church of that Parish. Now I'm a bit of a fan of churchyards. Apart from being interested in reading the headstones and musing on those people's lives, being uncultivated for Centuries, churchyards are a repository for Wildlife, and in cities can have remnant interest from the times when the church stood in countryside. St Mary's was no exception, being part of the Dorset Wildlife Trust Living Churchyards project. But let me begin with the light. 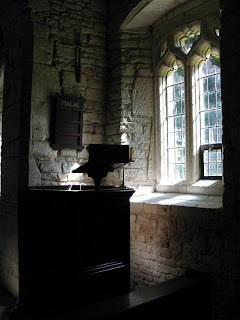 The afternoon sun was strong, the interior of the church, cool and dark. The contract........ well just stunning. Photographs can never really do that contrast justice, but here's a couple to whet the appetite. Back outside though in the hot sun, the churchyard was alive with insect life; loads of Large White, I even spied a Brimstone, which must be a second brood. 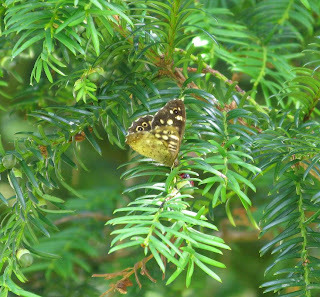 And of course the ubiquitous Speckled Wood. What would we do without Yew trees in Churchyards? 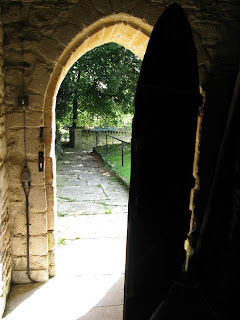 Strange to think many are older than the churches themselves, as many were planted by Pagans, or at least on sacred sites of the pagans, which were then adopted by the Church. 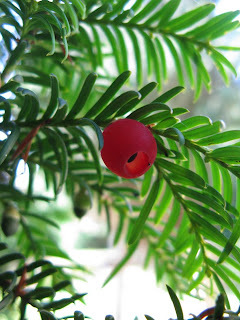 Yew is much maligned in my mind, seen as sinister as it is poisonous to some animals and has connotations with dark doings. But I love it, and it is a native tree. Look at the berry below, simple, colourful and exquisite.... don't you just want to eat it. But don't!! She wasn't mewing, the male was somewhere but where? Just then he flew off from another tree, the female joined in and the pair flew around and around the Church for ages, mewing and just had the appearance of enjoying the heat and the warmth and a nice rising thermal. 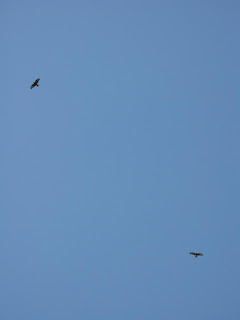 I love skylarks on the wing in the summer, but equally a hot August day, the air heady with heat, clear blue skies and the mewing of Buzzards overhead... I've seen the light and heard the call!! On a separate issue and to finish today's posting, as an ex-librarian, some recently published book news, and a bit of flagrant name dropping. Friend and colleague, Master Stephen Moss has just produced another tome, A Sky full of Starlings, recounting his first year relocating from London to the Somerset Levels. I haven't read it yet, but apparently my name's in there somewhere. I'm trying to find an unsigned copy, they're more expensive. Anyway I may see Mr Moss later today so will investigate. Friend, and fellow fan of Show of Hands, Gail McKenzie, along with her partner Rob Cousins who took the photographs, have spent the last year working on Go Slow England, Alastair Sawday's latest book covering where to stay to experience glorious organic and slow food. Now that's a job, being paid to stay in B&B's while writing a book. It's worth reading just for Rob's photographs... err! Finally, I'm confused. Recently I was sent the final report of the 2007, Mendip Farm survey, of which I and about 40 others tramped across the Mendips in the spring and summer of last year. The report concludes that intensification of the pastoral farming system is having a negative effect on bird numbers and diversity (only a single breeding Lapwing pair recorded), and yes, we've lost the Cirl Bunting. I also think personally as the Mendips are a playground for Bristol, there is a lot of disturbance, especially for ground nesters. This wasn't touched upon, as the report is really the starting block for further action towards target species. But why am I confused? Well this. Why was an Avocet used for the front cover? I appreciate it is the logo of the RSPB, but to my knowledge Avocets have never been recorded on the Mendips. A bit like having herds of Wildebeest on a Torquay postcard. Picky I know, but why not a Skylark, or Barn Owl. Ahh well !! Sunday dawned bright and sunny; so the boy Reiver after a full English decided to have a nature ramble on a bicycle. But where to go? Didn't want to drive anywhere, so why not cycle from home. Wick St Lawrence in the fair county of Somerset is found on the North Somerset Levels. Many do not realise that the Somerset Levels are in 2 parts, the northern part is not that well known, but of equal importance, and gloriously undisturbed by tourism. So chain oiled, saddle polished and I was off (as ever click on images for a better view). No plan, just see what happens. Heading off across the River Banwell at Ebdon Bow Farm, which is just a few yards from my house, great spot for Kingfisher, and a Grey Heron is usually here. Not today though. This is also an old orchard area, and remnant trees are now heavy with apples, a sure sign Autumn is around the corner. Autumn is my favourite time of the year and as I cycled that wonderfully atmospheric sound of wind through the leaves and reeds really makes me think of calm Autumn days, heat in the sun, and glorious colours. All this was brought to an abrupt end as I crossed the M5, a road I'd be on in less than 5 hours myself. Legs like egg whisks I pushed on to my first stop, Puxton and St Saviour's church. The church, no longer used for services is maintained by the Church Conservation Society, and the grounds managed for wildlife. Not much around the site today as for the first time ever I wasn't there on my own. A few people were taking the air and I had a nice chat to a couple from Bristol who'd come out especially to see the........ leaning tower. This tower is a local landmark, and I can't help thinking if this were Pisa crowds would be having their photographs taken. Not here though. 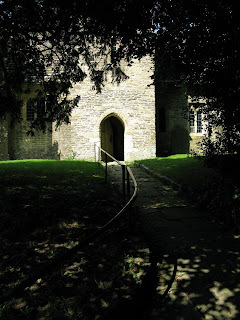 This is backwater land, quiet as a church mouse, yet only 15 miles from the centre of Bristol. Autumn, is however advancing. This Rose Gall was particularly splendid (not entirely which waspie caused it), and everywhere the red berries of Hawthorn can be seen. A lot of Purple Loostrife in flower too (I nearly went bustle over apex trying to photograph a bee on some, only to fall into an overgrown rhyne (ditch). Needless to say, the bee had gone by the time I'd extracted myself from the undergrowth. Good job no one was watching!! Back on the bike, I was pootling along, happy as a freewheeling Reiver on a bike can be. A thought. Why not cycle part of the Strawberry Line. This cycleway has recently opened and follows the old railway line which ran from Cheddar (home of not only a hard full fat cheese, but very early and delicious strawberry's) to Yatton Junction. From there the strawberry's of Cheddar were whisked to London and eaten a day later, with West Country cream.... yum! Sadly this romantic transportation of produce to the Capital is no more. 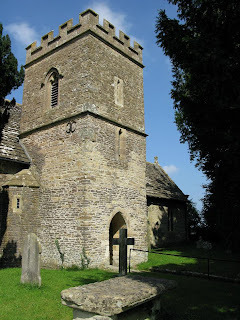 The section I was to cycle was the 4 miles from near Sandford to Congresbury. And I'm glad I did for 2 reasons. Along the route are "narrows" to deter cars, motorbikes etc. Dismounting to go through one, a woman and her 3 children having a picnic alongside this gave me a 7 out of 10 for style. Apparently I could have got 10 out of 10 if I'd cycled through. No doubt they wanted to see me cannoning through and off the gate to arrive at the other side sideways and on the ground. We had a good laugh though. The other reason I was glad to have cycled this was the photo above. A little difficult to see but this shows Swallows feeding on Hawthorn berries. Now I've heard of this phenomenon before where Hirundines, preparing for the long migration will change feeding habits from the usual insects to fruit, but this is something I've never seen before. At one spot the air was alive with Swallows as they swooped then landed, fed then flew off. 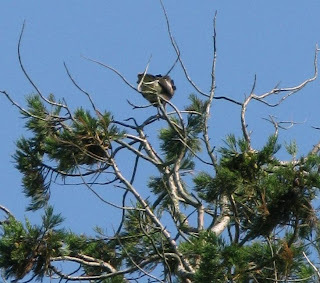 I watched this for about 10 minutes, sadly they were just a bit too far away to get a decent photo, but this at least shows what's quite an unusual behaviour. Eventualy making it to Congresbury, I realised I'd cycled 12 miles. Which brought me a shiver of realisation, I'd cycled 12 miles, so to get home, that was another 12. I took this photo to remind me of the "Long Way Home". I have to admit by the time I did get home at 3.30pm, I was a shadow of my former self. It'll do me good though. But nothing holds me back. Fed and watered on an overly large pasta meal, at 5.30pm I waddled out the door and headed to Lyme Regis for this years Candles on the Cobb. The last CotC was in 2005. It should happen every 2 years but that winter the pleasure gardens, obviously not having a good time, slipped into the sea in January 06. It took 2 years to rebuild the sea front, import thousands of tonnes of French sand, and English gravel to rebuild the beach and underpin the Gardens. And I have to say the Gardens are wonderful. now. The whole event is to raise funds for local and national charities, including both Devon and the Somerset & Dorset Air Ambulances, a very very worthwhile cause. 5000 candles are lit on the Cobb (number 3505 was my candle - at the top of this curving wall by the canons). Getting there early, I got my spot on a wall. By 8pm the Mayor was lighting the first candles. Many are bought to remember lost loved ones and the atmosphere while happy, is also very reflective as all around people are in thought, later there is a 2 minute silence for quiet reflection. I just wish though we could just have the silence and not Elton John's Candle in the Wind. I know it brings comfort to people, but why can't we just have the waves and the seagulls as we remember loved ones. The volunteers this year managed to light all the candles in record time, and with near perfect conditions, the candles remained lit for over an hour. A special message was lit in the sand this year for Phil Street, the co-organiser of this event, who due to work commitments was in America and could only watch on the Webcam. Even the canons had candles, and by 9pm the crowds showed no sign of leaving, which was good as finally a laser shone from the Cobb into the night sky. If you wish to see more, Lyme Regis Radio have produced a video of last night, at the moment it's a rough cut film, but will be edited and on-line soon. Strange day yesterday. It began as a "come and collect your stuff" day and ended up with a very clever piece of wood engineering plus a bottle of very acceptable award winning Chianti. I shall elucidate. After 8 years, Border Reiver is a single man again. So yesterday was a bit of a sad day, collecting the remnants of his life in a bin bag. I wonder why when everything goes pear shaped, bin bags feature prominently in one's life? Why not a suitcase or a wicker basket? So by early afternoon, car packed, nothing else to say, we parted. Didn't fancy going straight home, so popped to the the 4th Stock Gaylard Oak Fair, North Dorset. I'm not 100% sure what Gaylard is, or why it's stocked in North Dorset, but I'm sure someone will tell me it's uses. I like this Fair as it's small, has a purpose (for all of those interested in timber, woodcraft, countryside and conservation) and set in the gloriously English landscape of mature broadleaved trees in a parkland setting. Sadly I didn't get the photo the Fallow Deer here as they'd moved over to the far side. Not literally you understand. So here's a photo journey of the hour or so I spent there (as ever, click to enlarge). Throwing out time from the Cider Tent, mind you they seem to have thrown out some strange looking furniture. And do you think this Spaniel is having a good time? My dog was never as obedient as this, he'd have been out and chewing your leg by now!!! A felled Oak. Why have I photographed this? Well here's a story, the Oak had died (Ahhahh) and needed to be felled, so along came Adam's Axemen, who felled the tree in the morning (boo hiss, leave it for wildlife). But no, this tree will now be "Hung, Sawn and Quartered (sorry) to return in the form of furniture, turned bowls and many a myriad of the woodmizers artform next year (August 29th). Hold me back with these two photos. Aint's she a beauty.... I could crush a grape seeing this. Back when the old King was on the Throne and I were nowt but a pimply lad, I used to work on Harry's farm. Harry's dad, old Mr Gibson (never seen without a shirt and tie on) had one of these for leading hay and general light duties around the farm. It was the very very first motorised vehicle I ever drove, (the next was a Diahatsu fourtrack - explains a lot about my driving technique). To see this classic example was a reet bobby dazzler experience. I may just have to visit the Gt Dorset Steam Fair next weekend. Two photos of a Little Grey Fergie powering a man with a plank of wood. Traditional Shepherds Hut with the skeleton of a Yurt. Dorset Yurts (sort of canvas tent) are becoming popular and as such they had demonstrations of how they were made etc. And on the right, the Shopping Mall. Why can't all shopping be as civilised as this. Eyes left; Heavy horses, part of the British Horse Loggers Competition. Eyes right; either someone has left some toast on too long, or this is Charcoal Burning. Can this really be environmentally friendly? Smoke from this small oven, engulfed the Fair. Talk about a carbon footprint, more a carbon overcoat. Good to see though. Ahhahh, serious Boys Toys. None of your namby pamby, well guarded, cut off switched, so safe they're boring machinery here. Make a mistake with this beast and it'll not half smart. I used to use one of these mounted on a Tractor PTO, and believe me without a guard in place, a 3 foot circular saw revolving 6 inches from me IS respected, no day dreaming when working one of those!! But what are these two strange wooden objects? Mike Taffinder makes these jolly ingenious wooden tea towel holders. Using Archimedes first principle of "jam some cloth into a wooden peg using a glass marble", Mike has honed this craft to perfection. Brilliantly simple, and wonderful at only £7 each. We bought one last year, so as a pick me up today, I bought two. I know, I know, it's the wild side in me, can't help myself. And so home, left the binbags un packed, opened a rather robust bottle of Italian Red, and glugged the evening away listening to Radio 4 on the trusty old Roberts. Tomorrow, as they say, is another day. Feeling depressed at not being at the Bird Fair, today's blog is a walk over the Mendips. To be accurate a 2 hour walk up Black Down, Rowberrow and to the trig point at a heart pumping 1068 feet, and a 30 minute slippy slide back down. I last did this walk in the spring of 2007, whilst taking part in the RSPB/Mendip Hills AONB breeding bird survey. At the time I said I must come back her and have a walk, little knowing it would be 15 months later. Where does the time go. My walk began at the bottom of Burrington Combe (in North Somerset), the top of the Combe is in Somerset proper like. Starting quietly enough along and up Link Lane, the tarmac road soon peters out into a muddy track and after the recent monsoons, a very wet muddy track. Meet Bill. Bill is a dog and out for a walk. Bill's dad, Doug and I frequent the same working establishment, so very odd that the first person I should meet was Doug, hot footing it home to purvey a Sunday finest with all the trimmings for Mrs Doug and the little Doug's. Notice how clean Bill is, apparently today he's been avoiding the puddles. After this brief interlude of employment camaraderie, my walk continued along the woods, where a single Raven could be heard cawing, before the track turned left and up a hill. Or if you are as unfit as me a cliff, obviously. However just before heading up the hill, the track became alive with Gatekeepers on Ragwort, must have been about 100 in one area, staggering. Onwards and upwards McDuff, I plodded through the sloshy wet bog. Luckily the rain was keeping off, but there was a keen wind. Which meant that bird life was scarce, a few Linnet, a single Meadow Pipit and a few Carrion Crows. I did though startle a Roe Deer just in front of me, which shot off through the bracken well before the camera could be up and out for a shot. Sadly though even though it is mid August at this height, Autumn's fingers are gaining a grip. Whilst Heather Calluna vulgaris and Bell Heather C. cinerea (slightly more pinky one in the middle) in the left hand photo are in full flower, with the Yellow of the Gorse, who can say moors are bleak and dull. At last though I made it to the summit, over 700 feet from where I'd begun. If you enlarge the left hand photo, in the distance is Brent Knoll (a remnant volcanic plug), the Bristol Channel and in the distance the Brendon Hills and Exmoor. Not a bad view if I say so myself, even on a dull blustery day like today. Which was good, not that many people up there. From the other direction, Burrington Coombe opens up it's Limestone gash in the landscape. Finally on the way down, two more insects, a very worn Speckled Wood on the right, but does anyone know what the Bush Cricket on the left is? I don't. Not a bad walk considering I was only 15 miles from the centre of Bristol. Oh and enlarge the photos if would like a better view. Walking in the rain - why?